MOSCOW, September 28. /TASS/. The plans of the Ecumenical Patriarchate to grant autocephaly to the Ukrainian Orthodox Church signals the aspirations to power wielding by the former, metropolitan Hilarion, the chief of Moscow Patriarchate’s department for external Church relations told Izvestia daily on Friday. "What’s happening in Ukraine now is not a simple territorial dispute between the two Churches, as someone might think," he said. "That’s something bigger. This is a conscientious and open imposition of powers by Constantinople on others and it’s tantamount to papist claims." "We can see quite clearly the Patriarch of Constantinople doesn’t consider other local [national] Churches as subjects in pan-Orthodox relations," metropolitan Hilarion said. "From his point of view, Phanar [the official residence of the Patriarch TASS] is the only place where all the decisions can be taken." The Ecumenical Patriarchate has no plans to discuss the problem of Ukrainian autocephaly not only with the Russian Orthodox Church but with other local Churches either, he said. 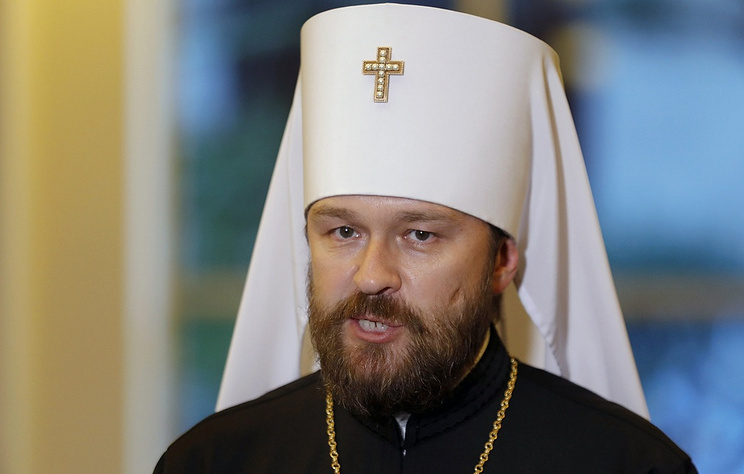 "Even the delegation, which Phanar empowered to hold talks with local Churches on the Ukrainian problem, visited their Primates for telling them about a decision that had already been taken, not for taking counsel with them on Constantinople’s plans," metropolitan Hilarion said. "The envoys of the Constantinople Patriarchate said it more than once." "The Russian Church shouldn’t fear an isolation of some kind," he said. "If Constantinople continues its non-canonical actions, it will put itself outside the canonical field, outside the canonical understanding of the Church organizations that gives a distinctive mark to the Orthodox Church." His Eminence Hilarion recalled that after the Great Schism of the Holy Christian Church in 1064, which divided it into Eastern Orthodoxy and Roman Catholicism, the Patriarch of Constantinople has always occupied the top position in the Diptychs - the table specifying the order of commemoration of Primates of Orthodox Churches. 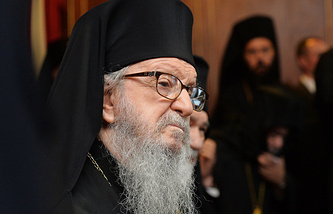 "This precedence has always been viewed as precedence of honor but not precedence of power and the Patriarch of Constantinople has been viewed as the first among the Primates of autocephalous Churches, who are equal to him," Metropolitan Hilarion said. "It was only in the 20th century that the Ecumenical Patriarchs began to lay claims to some particular powers in the in the Eastern Orthodox Church but these ambitions are devoid of theological or canonical grounds," he said. At present, Ukraine has only one religious organization that has the canonical status in the world of global Eastern Orthodoxy - the Ukrainian Orthodox Church reporting to Moscow Patriarchate, which is led by Metropolitan Onuphrius of Kiev and all Ukraine. Simultaneously, the country has two more organizations referring themselves as Orthodox Churches - the Ukrainian Orthodox Church reporting to the so-called ‘Kiev patriarchate’ and the Ukrainian Autocephalous Orthodox Church that takes root in a reformist movement of nationalistic Ukrainian clerics of the early 20th century. The canonical Church has about 12,000 parishes and 200 monasteries in its realm. Ukrainian authorities have been striving to set up a national Orthodox Church disconnected from Moscow Patriarchate since the former Ukrainian Soviet Socialist Republic declared itself independent from the USSR in 1991. On September 7, 2018, the Ecumenical Patriarchate appointed two exarchs to Ukraine as part of preparations for granting autocephaly to the Ukrainian Church. The Synod of the Russian Orthodox Church expressed resolute protest over and profound indignation over the move.